1 of 2 In small bowl, whisk together the vinegar, shallot, mustard, salt and pepper. Gradually whisk in oil until thick. 1 of 4 Cut stems from beets, leaving 1 inch of the stems intact. Rub beets with oil. Place in roasting pan. 2 of 4 Bake in 375 degree F oven 75 to 90 minutes or until knife-tender. Remove from oven. When cool enough to handle, trim and peel beets; cut each into 8 wedges. In large bowl, toss with 2 tablespoons vinaigrette. 3 of 4 Bring a small pot of water to a boil. Add the sliced garlic; boil for 1 minute. Drain. 4 of 4 To serve, in large bowl, combine radicchio, arugula and garlic. Add remaining vinaigrette; toss. 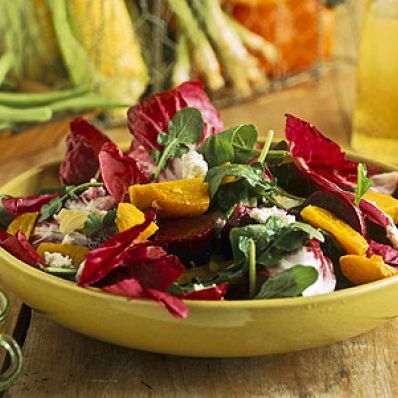 Arrange beets over greens. Top with cheese. Makes 6 servings.